Hybrid crystals for efficient LEDs; bigger graphene, faster; exploding silicon. A team from the University of Toronto combined two promising solar cell materials together for the first time, creating a new platform for LED technology. The team designed a way to embed strongly luminescent nanoparticles called colloidal quantum dots into perovskite. Perovskites are a family of materials that can be easily manufactured from solution, and that allow electrons to move swiftly through them with minimal loss or capture by defects. The result is a black crystal that relies on the perovskite matrix to funnel electrons into the quantum dots, which are extremely efficient at converting electricity to light. The resulting heterogeneous material is the basis for a new family of highly energy-efficient near-infrared LEDs. Infrared LEDs can be harnessed for improved night-vision technology, to better biomedical imaging, to high-speed telecommunications. Combining the two materials in this way also solves the problem of self-absorption, which occurs when a substance partly re-absorbs the same spectrum of energy that it emits, with a net efficiency loss. “These dots in perovskite don’t suffer reabsorption, because the emission of the dots doesn’t overlap with the absorption spectrum of the perovskite,” explains Comin. The team designed their material to be compatible with solution-processing, so it could be readily integrated with the most inexpensive and commercially practical ways of manufacturing solar film and devices. Their next step is to build and test the hardware to capitalize on the concept. Millimeter-sized crystals of high-quality graphene can be made in minutes instead of hours using a new scalable technique, Oxford University researchers recently demonstrated. In 15 minutes the method can produce large graphene crystals around 2-3 millimeters in size that would take up to 19 hours to produce using current chemical vapor deposition techniques. The researchers took a thin film of silica deposited on a platinum foil which, when heated, reacts to create a layer of platinum silicide. 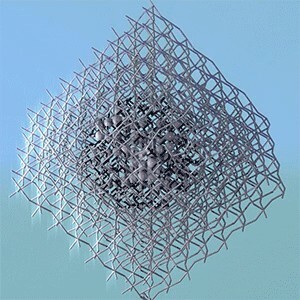 This layer melts at a lower temperature than either platinum or silica creating a thin liquid layer that smooths out nanoscale valleys in the platinum so that carbon atoms in methane gas brushing the surface are more inclined to form large flakes of graphene. The Oxford team believes that their approach could also have benefits beyond speed and quality: with a thicker liquid layer to insulate it, the graphene might not have to be removed from the substrate before it can be used – a costly and time-consuming additional step required with all other methods. Scientists from the Australian National University made exotic new materials by creating laser-induced micro-explosions in silicon. By focusing lasers onto silicon buried under a clear layer of silicon dioxide, the group perfected a way to reliably blast tiny cavities in the solid silicon. This creates extremely high pressure around the explosion site and forms the new phases. These complex phases are often unstable, but the small size of the structures means the materials cool very quickly and solidify before they can decay. The new crystal structures have survived for more than a year. The team’s new method could lead to a much cheaper and industrially-friendly method for large scale manufacturing of these materials.